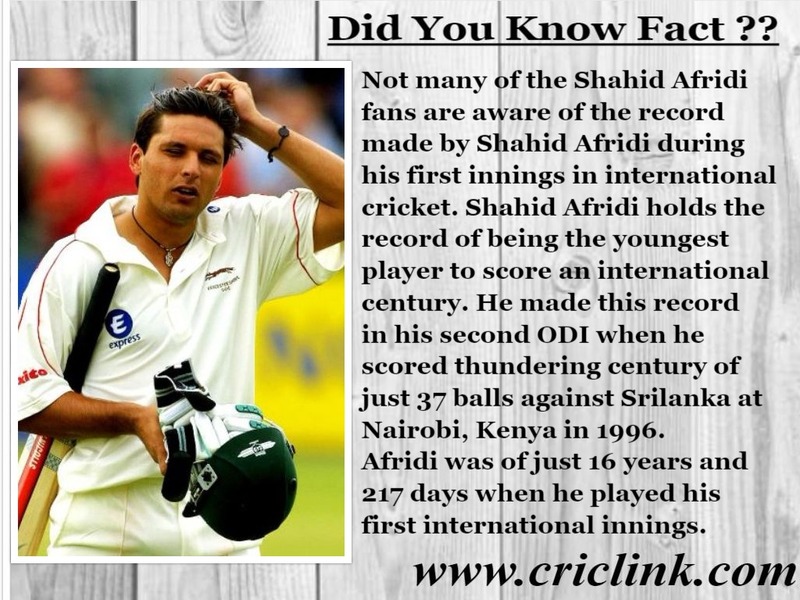 Not many of the Shahid Afridi fans are aware of the record made by Shahid Afridi during his first innings in international cricket. Shahid Afridi holds the record of being the youngest player to score an international century. He made this record in his second ODI when he scored thundering century of just 37 balls against Srilanka at Nairobi, Kenya in 1996. Afridi was of just 16 years and 217 days when he played his first international innings. During this innings Shahid Afridi also made record of fastest Century and equaled the record of most sixes in an ODI innings both was previously held by Srilanka’s Sanath Jayasuria. But both of these record were also taken over from Shahid Afridi in fast paced cricket. Previous Article Did you know that how Marvan Attapatu started his test career ? Next Article Money and Glamour can have adverse effect on PSL!